Born on 20 May 1832, Anne Powell (nee Pugin) was the only child born to A.W.N. Pugin by his first wife, Sarah Anne Garnett, who died a week after giving birth to her. 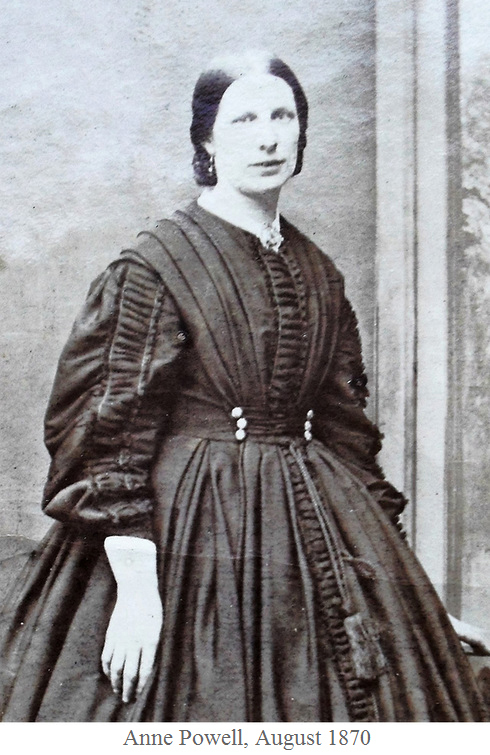 A year later she acquired a step-mother, Louisa (nee Button), and the family moved to Ellington Cottage, St Lawrence, Ramsgate, so as to be near Pugin’s aunt, Selina Welby. In 1835 Pugin, Louisa and Anne moved to St Marie’s Grange, the house Pugin had designed on the outskirts of the city. He sold it in 1841, and went to Cheyne Walk, Chelsea, from where he planned his second Grange – St Augustine’s – on West Cliff, Ramsgate. 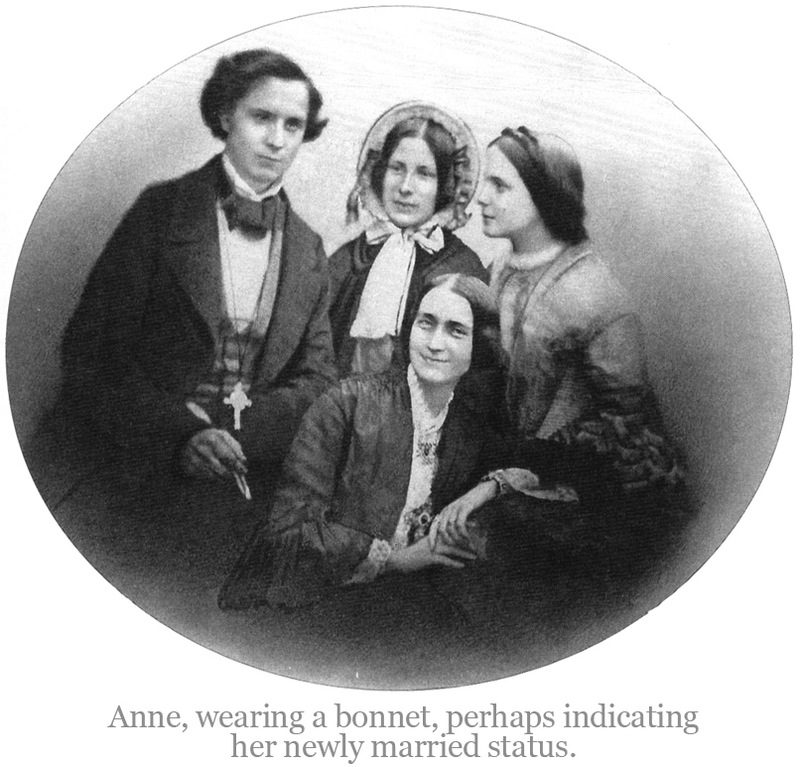 By the time it was ready to live in, Anne had already moved house four times, gained five siblings, lost a step-mother (Louisa Pugin died in 1844), and all of this in the space of twelve years. She had also to contend with her father’s sudden mood-swings, nervous exhaustion, and frequent absences from home. 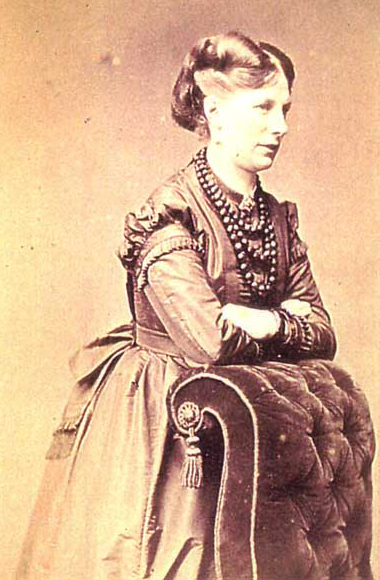 Pugin remarked that by the time she was fifteen Anne – nicknamed ‘Toddy Wattles’ - had a mature head on her shoulders: an indication of how she had been obliged to leave her childhood behind and assume some responsibility for a growing number of younger brothers and sisters. By 1845 there was another member of the Pugin household, namely John Hardman Powell (1827-1895), nephew of John Hardman of Birmingham. Pugin had agreed to take him on as an apprentice, and have him live at The Grange, where he first encountered Anne, describing her as ‘an elegant maiden’. Friendship blossomed into a romantic courtship, and they were married on 21 October 1850, the first wedding to take place in Pugin’s church of St Augustine, Ramsgate. They moved into no. 3 Southwood Terrace, where, just a year later, Anne gave birth to a baby girl whom they named Mildred. There were post-natal complications, but the Powells were to have eleven more children, two of whom died in infancy. The twelfth – Dorothea – was born in 1877 when Anne was forty-five. Anne had a love of music, and she learned to play both piano and organ, returning to The Grange for lessons, until she acquired a piano of her own, fitted with Gothic candle-sconces and ‘red silk to match the room’. After Pugin was admitted to Bethlem Hospital in February 1852, the design-work hitherto carried on at The Grange was transferred to the Hardman works, and so the Powells moved to Birmingham. Musical interests continued as they attended concerts in the Town Hall including the first provincial performance of Beethoven’s Ninth Symphony on 9 September 1852, and Anne noted her impressions in a little pocket-book. The next entry is a sombre one: ‘My very dearest Papa died on Tuesday the feast of the Holy Cross, the 14th of September at 5 o’clock in the evening’. In addition to raising her own growing family, Anne felt a continuing responsibility towards her siblings. Agnes, Margaret and Peter Paul Pugin were regular visitors, and as it emerged that Peter Paul had a talent for drawing, Powell took him in hand, suggesting that he might have future as a seascape artist. In the early 1860s the Powells moved to a house of their own in Edgbaston, not far from the Oratory. Bl. John Henry Newman became a family friend. 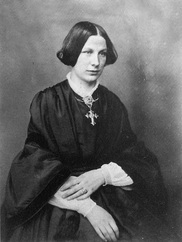 Anne and her daughters made him vestments and altar-linen, and when, in April 1882, their third daughter, Edith, married John Knill – a relative of Jane Pugin - Newman officiated at the wedding. 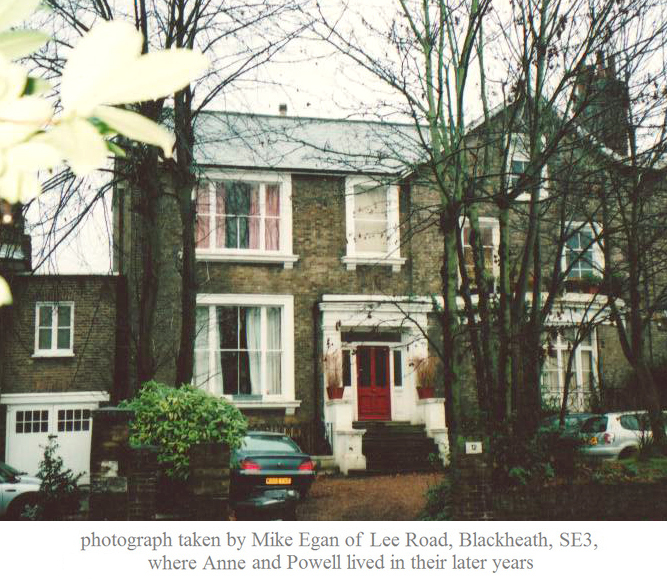 Shortly afterwards the Powells moved from Birmingham so as to be close to Edith and John in Blackheath, with Powell now taking charge of the London end of the Hardman business. Their son Dunstan now became chief designer at the Birmingham stained-glass works, while Sebastian Pugin Powell pursued an architectural career in the firm of Pugin and Pugin. John Hardman Powell succumbed to the ‘flu epidemic of 1895, and died on 2 March. 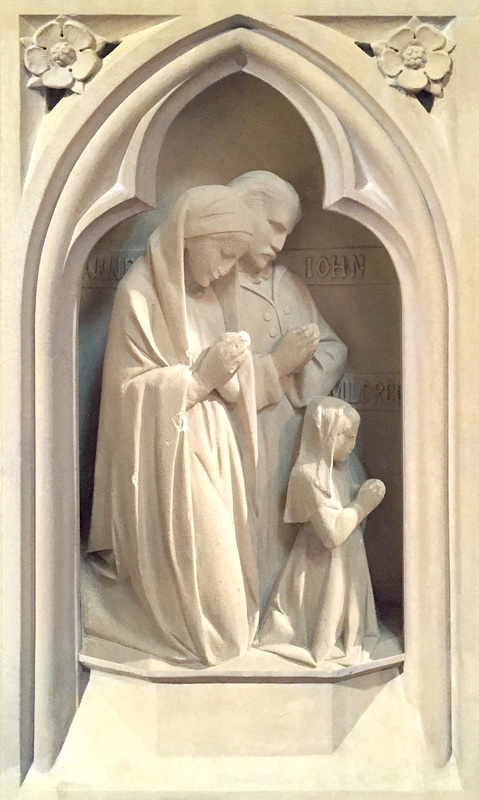 Anne moved back to Birmingham where she died on 16 January 1897, and was buried alongside her husband in the Pugin chantry at St Augustine’s, Ramsgate.